Swedish/Finnish progressive metal "supergroup" SOLUTION.45, which features in its ranks former SCAR SYMMETRY vocalist Christian Älvestam, Mikko Härkin (ex-SONATA ARCTICA, KOTIPELTO) and Jani Stefanovic (MISERATION, ESSENCE OF SORROW), recently completed work on an eight-song demo with producer Plec (SCAR SYMMETRY). Jani Stefanovic has issued the following statement regarding the SCAR SYMMETRY comparisons that have been thrown around due to smiliarities in the two bands' sound: "First of all, I have had these songs ready for about two years. Second of all, Älvestam was a part of SOLUTION.45 before he departed from SCAR SYMMETRY, so this is no substitute for SCAR SYMMETRY on his behalf. AND SOLUTION.45 is not a band Älvestam created after he departed from SCAR SYMMETRY. Meaning that someone seems to think Älvestam created a new band that would be similar to his great success in SCAR SYMMETRY, which is not true, since Älvestam is not the founder of this band. Älvestam and Anders [Edlund, bass] were the two last members that joined the band. Two very important members of this band. It is useless to say that Älvestam carries a great importance within this band. "For those who think SCAR SYMMETRY created Älvestam's style, so wrong. "Älvestam's style is his creation since way before SCAR SYMMETRY. Meaning, SCAR SYMMETRY did not make Älvestam sound like he did; it was his style and he brought it into that band. SCAR SYMMETRY just happened to be the place where it really got attention. "So SOLUTION.45 will surely not be the last of bands where you can hear Älvestam sing like this. "It is free for anyone to compare and throw opinions. Probably a thing we can't avoid. But now you should have at least a bit more facts around the subject. Because how I see it. It is pretty useless for people to debate about something when they actually dont have all the facts right. "To wrap it all up. SOLUTION.45 is here to stand on its own legs and not be a substitute for any other band out there." 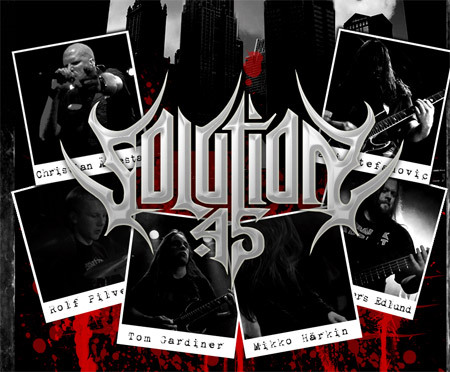 Christian Älvestam previously stated about SOLUTION.45: "For all of you who like my multi-vocal stuff in SCAR SYMMETRY, I'd like to introduce a somewhat new band I've got going since the late fall of 2007 called SOLUTION.45. Since I'm responsible for introducing the multi-vocal style in SCAR SYMMETRY, as well as writing like 75% of all the vocal-melodies and 90% of all the growled parts, you will most likely recognize the style and hooks in SOLUTION.45. I've been writing and doing these multi-vocals since the early '90s in several bands (such as UNMOORED, SOLAR DAWN and SCAR SYMMETRY, to name a few) and since this style very much reflects who I am, musically, I have no plans abandoning it any time soon! All the aforementioned bands have vocally been a lengthening of my urge to write and experiment with these different vocal-styles and hooks and SOLUTION.45 feels very much like the next natural step, in this 15-year long journey, starting back in 1993 with the birth of UNMOORED! It's been a while since it felt this inspiring and rewarding though!"